An episode three months in the making, a cross-over with the crew of The Reality Check (Cheque?) podcast: Astronomy! I had wanted to have the group on this podcast because they had been so generous over the last few years having me on several times, but I couldn’t figure out a good angle. Then, someone (sorry, forget who, but it wasn’t me) suggested we just do a TRC-style show but with astronomy topics. The Reality Check, for those of you who do not know, is a weekly Canadian show that is now just under a half-hour that has four hosts and typically three completely random segments per show. It’s almost nine years old, and it’s kept with that basic format throughout its entire run. For almost all the segments, I asked them to choose topics from various requests that I’ve gotten over the years. We also did a quiz, in TRC style, that gave me a new appreciation for those on the show who conduct those quizzes every few episode. It clocks in at a little over an hour, which is still short considering that my original audio was nearly 1 hour 50 minutes. Pat Roach, the producer of TRC, did the first cut at merging everyones’ audio and cutting out all the stutters and restarts, so a big thanks to him because I did very little after his first cut. I’ve been putting him off for awhile because I really really don’t like Electricity & Magnetism, so doing this was going to be a bit out of my comfort zone. It ended up not being that far out, thanks in part to generous help by Phil Plait’s Bad Astronomy website and the 2012 Hoax website. However, listening to Coast to Coast for clips took a very long time. Two straight days, listening at 1.7–2.5x speed. I took pages of notes, including numerous direct quotes. I mined these and wrote an incredibly lengthy episode that used 18 clips totaling nearly 15 minutes. Then I decided to split it into two parts. This first part covers just his ideas about comets. This episode also has a Q&A (first time in many episodes) and Feedback. Practically on time comes part 2 of the two-part overview of the Electric Universe. This one is also a bit heavy with the math, so I recommend heading over to Tom’s site for more information and many, many more details. So, um, with the deadline for a major grant program coming up in a few days, that’s it folks! Happy TAM for all those who are here in Vegas, and attending TAM. As my own kick-off, since (for those who don’t know) today’s the first official day of stuff, we have Episode 115 of the podcast, the Electric Universe, Part 1. Part 2 will be out later this month where we’ll get more into the electric sun ideas, and why they fail. In other words, while this episode is an overview of the concept, and a lot of the history, the next episode is going to get more to specific examples of predictions and how the data fail to support them. Oh, and the interview, for those who don’t read the title of the blog post, is with Dr. Tom Bridgman of the “Dealing with Creationism in Astronomy” blog. Podcast Episode 112: Is Mercury’s Magnetic Field Decaying? Does that Prove Recent Creation? Or just stayed the same? For this episode, we return to an old stalwart of the blog: Young-Earth creationism, and I examine the relatively recent claim that Mercury’s magnetic field is decaying, therefore God. It’s a bit of a nuanced topic, since, to understand it, we have to get into magnetic fields and how you measure them around planets. Hopefully my squishy water balloon analogies make sense. It’s a bit of a shorter episode, three days late, but I’ve been pretty busy catching up with work that I let slide while I was working on the Cydonia movie. Oh, and the logical fallacies in the episode are: Cherry picking, and quote-mining. For the third episode written and recorded in 10 days, we finish off the idea of pole shifts started in February with the magnetic pole shift. And that is it. Puzzler for this time is based on last episode, not this one. I started listening to Coast to Coast AM somewhat regularly when I started to “get into” modern science-based skepticism. I wanted to know what the “true-believers” thought and to learn about all sorts of ideas that are out there. Often, the ideas are anti-“establishment,” which is why they are a supporter of Ron Paul or “alternative medicine.” Often they’re “new-agey.” Sometimes they’re both. Sometimes they’re so over the top that you have a difficult time believing people actually think that. Sometimes the people on the show (often, actually) will distort the actual facts to support their claims. Sometimes they will make them up. This long rambling introduction is to point out all of the things that various C2C guests bring. The one I’m going to discuss here brings in all of them. This is a somewhat long post, but there is a lot to say about Gregg Braden. If you’re wondering who this person is, I’m not going to give a short bio section, rather I’m going to illustrate his views through time throughout this post, like dipping a candle in successive colors. I listened to about 16 hours of interview, and then I re-listened to about half of them to pull out the quotes and points I wanted to use for this (and maybe an eventual podcast). Okay, technically I only had one episode from February 5, 1999, and then the next was in 2006. But based on later material, things changed for Braden in the few years after Sept. 11, 2001. I’ll talk about that later. During this earlier time, Braden comes off as your standard new-agey anti-establishment person: Darwinism is evil, consciousness rules. There really wasn’t much unique about his message. He was an avid advocate of “free energy” devices, claimed there was copious evidence that our DNA was currently evolving rapidly even though he doesn’t “believe” in evolution, that through consciousness we can “activate junk DNA” and do kewl stuff, and generally ranted for four whole hours on how scientists won’t let the “real” knowledge out to the general public. Fairly run-of-the mill, really. In this interview, I noticed something of a shift in Braden’s attitude. While he was still hawking his books and advocating his ideas, he seemed to have shifted more towards alleged evidence for his claims and “research” he was doing. This was much more evident in the later interviews (next section). Now we really got into the idea of “let’s throw out some sciencey stuff that sounds more real than what I peddled a decade ago” (no, he didn’t actually say that, that was my impression). He makes a few interesting claims. The first I noted down is during hour 2 of the program at 17 minutes into the hour, he states that Nature (one of the top science journals in the world) published a study by Silvertooth in volume 322, August 26, 1986, page 590. It’s actually August 14, but I’ll forgive that. (Here’s the “study,” subscription required.) Problem is that this was not an article Nature “published,” it’s a letter that they included that spans less than 1/3 of a page. In it, Ernest W. Silvertooth claims to have conducted an experiment that proved there is an “ether” through which light propagates, disproving General Relativity, and the famous Michelson-Morley Experiment (conducted where I got my undergraduate degree … a century earlier). Interesting. It’s a letter to the editor. Not peer-reviewed. Silvertooth’s name shows up on Anti-Relativity.com. And the only way he got a paper out is by publishing it himself. And yet Braden claims this is undeniable proof that scientists won’t let the secrets of the universe out and that this guy irrefutably showed that the standard ideas are not real. However, he takes this a step further to say that the “ether” is not just a medium through which light travels, rather it’s the general consciousness field in which we all exist. Got all that? I warned you he’s a new-ager. But he made some specific statements. The easy first one to check on is the field strength of the heart and brain. According to this source, the brain’s value is on the order of 0.1-1.0 pT, or picoTesla (10-12 = 1 pico). And according to this source, the strength of the heart is around 10 pT. So he’s sorta right in his first statement that at the extremes, the heart’s magnetic field at the surface of the body is 100x stronger than the brain’s. But not 5000x as he states a few sentences later. And it bears mentioning that Earth’s field is on the order of 10-4 T at Earth’s surface, or 107 times stronger than the human heart’s as measured from the surface of the body. He also was talking about how magnetic and electric fields are different, which I really don’t want to get into in this post, but basically he’s stretching the truth. Yeah. Please show your work. At this point, he is invested more fully in the idea of his Institute of HeartMath and Global Coherence project and he starts to bring in alleged evidence for his claims. This was where I really got interested, and frankly it’s about the only part that really gets into the topics I discuss on this blog (astronomy, physics, geology). Its within these that he adopts the standard “amateur science” motif that we ridicule in skepticism: He misinterprets basic data and misrepresents other data (one could call it lying, but that implies I actually know that he knew he was doing these things, and I don’t — at the very least, he is sorely mistaken and data-mines). I already addressed the whole atom an magnetic field and electric field and heart-brain fields with the 2006 interview. And evolution with the 1999 interview. He also talks about 2012 in this one, but there’s really nothing new he contributes to the mythos so I don’t want to go into it here. He also makes a specific reference to another Nature paper about the Milky Way’s black hole and energy shooting towards us, saying it’s by “Rhode and Miller” in volume 434, October 2004. Problem is that volume 434 is for March-April 2005, and October 2004 is in volume 431. I searched all and could not find it. So much for that. “September 2001, two geostationary operational environmental satellites (GOES) orbiting the earth detected a rise in global magnetism that forever changed the way scientists view our world and us. The GOES-8 and GOES-10 each showed a powerful spike of Earth’s magnetic-field strength in the readings they broadcast every 30 minutes. It was the magnitude of the spikes and the time they occurred that first called them to the scientists’ attention. Yes, those were long. The bottom-line claim here is that Earth’s magnetic field was altered by human emotion during the September 11, 2001, terrorist attacks in New York City. This is similar to claims by the Global Consciousness Project, but different. The nice thing is that this is highly objective data that’s easy to find and check. Which I did. I even contacted the institution that runs the GOES to get a bit of help and information (thanks to Dan Wilkinson and Ted Haberman). For brief background, GOES are and have been many different satellites, and they are periodically launched and decommissioned as one wears out and technology advances. We’re now on GOES 11 and 13 as the main two, though GOES 12, 14, and 15 are in orbit. In September 2001, GOES 8 and 10 were in operation (it looks like there were some issues with GOES 11 at that time). These satellites orbit at about 6.6 Earth radii from the planet, and our magnetic field extends to about 10 Earth radii, so it is correct that they can measure the magnetic field, and they do contain instruments to measure magnetic fields at their location. Though they send back data that’s binned in 5-minute intervals, not 30-minute intervals. The data that Braden and others present at their Global Coherence Institute is the exact image below (I’m directing to their web site so you know I’m not making it up). Looks kinda interesting. The field is varying between about 50 and 125 nT (nanoTeslas) in the four days leading up to Sept. 11, 2001, and then it spikes to 173 nT as seen from one satellite and 153 nT as seen from another. Then it seems to vary slightly more than it had in the few days after. Do we have something here? Are they making these data up? Actually, they’re not. The data do show that spike. You can view it for yourself here for GOES 8 or here for GOES 10. So now the logical question in evaluating this claim is, “They’re showing a week-long window. What does the field look like at other times? What’s the normal variability?” And let’s avoid any idea they might claim of contamination from the craziness of that month. To answer that, I chose a random month and I skipped back to June 2001. The data I show below (all data is on that site, specifically downloaded from here) show that the normal variations for the magnetic field are about 60-125 nT (so that agrees with the Sept. 2001 baseline), but in this random month of June, there were spikes all the way up to 186 nT (higher than Sept. 11, 2001 by about 15 nT). Hmm. In fact, since I have the data in my grubby little hands, I can actually do some basic statistics. The average from GOES 8 during June 2001 was 113 nT, and from GOES 10 it was 97 nT. The standard deviations were ±10.6 and ±14.6 nT, respectively. In September 2001, the averages and standard deviations were 109±14.2 nT and 95±20 nT. So they agree with each other. September 2001 was not an odd month at all. I then chose a different random month and year, January 1998 (the Global Consciousness Project people would probably say they’d expect at least two significant events during this month, one for the new US Congress taking office and one for New Year’s Day). Or November 2007. Both of those months’ data are displayed below. The maxima were 173 for GOES 9 in January 1998 (but a minimum of only 22 nT!) and 188 nT in November 2007 with GOES 11 (there was some data drop-out in the last week of the month from GOES 10). The inescapable conclusion at this point is – as I said before – at best it’s “window-shopping” or data-mining. At worst it’s willful deceit of their audience. As is clearly shown by these data, the September 11, 2001, “spike” in Earth’s magnetic field is not an abnormal “spike,” but rather we see fluctuations even larger than that several times a month. This actually brings me back a bit to what I consider “fair game” in terms of skepticism and this blog. I’m okay if you want to be a creationist, a UFO believer, a new-ager, or whatever (so long as you don’t try to force your beliefs on me). But when you actually start to point towards observable, checkable evidence for your claims, it’s totally fair game. And as I’ve shown here, Braden would be much better off sticking to his random new-agey claims than trying to use science to back them up. Does Earth’s Decaying Magnetic Field Mean it Was Created 6000 Years Ago? I took a look through my blog posts for the last nearly three years and was actually surprised to find that I have not yet addressed one of the main young-Earth Christian creationist (YEC) claims for why at least Earth supposedly cannot be more than 6000 years old: Earth’s decaying magnetic field. A recent Creation.com article by Dr Jonathan D. Sarfati B.Sc. (Hons. ), Ph.D., F.M., reminded me of this. Let’s take a look. Moving on, ship captains used Earth’s global magnetic field to navigate, but even in the 1700s, they realized that Earth’s magnetic field changes from year-to-year. In fact, they had to purchase new maps to correct for magnetic pointings to actually know where they were. Without a correct and current map, they could be off by tens or hundreds of miles — something significant when that reef is coming up. Around the turn of 1900, scientists were able to start to accurately measure the global magnetic field strength. They have continued to measure it over the past century. What has been found is that the field strength is decreasing. Between 1900 and 2000, the field strength has decreased by very roughly 6%. Based on crustal rocks, we have been able to tell that the decline is about 35% from what it was about 2000 years ago, and it seems to have accelerated a little bit over the past few years. We also know that the current magnetic north pole is moving, traveling towards Russia at something like 50 km per year, while the south magnetic pole is moving somewhat more slowly these days, but it moved more quickly in the early 1900s. What this does is paint a picture of a dynamic process that creates a global magnetic field that changes with time, the change being to its strength, specific pole locations, and even overall orientation. There are actually two scenarios proposed by different YECs to use this to promote their worldview. 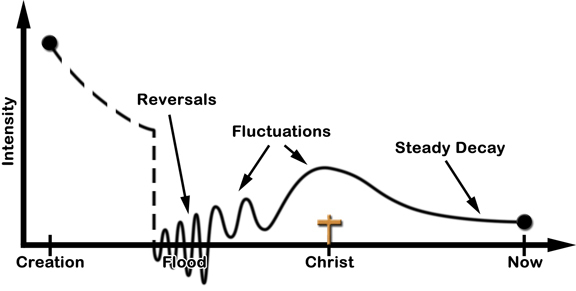 The first is one that I could not find anyone who still believes it other than “Dr.” Kent Hovind, a YEC who calls magnetic reversals “just a bunch of baloney … this is a lie talking about ‘magnetic reversals'” (from “Creation Science Evangelism” Series, DVD 6.1). That quote is actually from the article in question for this blog post, “The earth’s magnetic field: evidence that the earth is young” by “Dr Jonathan D. Sarfati B.Sc. (Hons. ), Ph.D., F.M.” As a side note, I find it interesting that he feels the need to flout his degrees. It’s like me calling myself “Dr. Stuart J. Robbins B.S., M.S., Ph.D., Th.D. (Hon. )” (yes, I have an honorary doctorate in theology from Thunderwood College). So the basic idea is that if you trace the field strength back in time, based on its current trend, then you reach a point before 10,000 years ago when the field would have been too strong to (a) be physically possible or (b) to allow life to exist. Seems plausible, except we have that pesky thing of magnetic reversals. And that thing about extrapolating past trends for 100x the length we observe the current trend for something that’s as dynamic as a magnetic field is pretty stupid. I’m reminded of the disclaimer during the South Park episode about Scientology that stated, “YES, SCIENTOLOGISTS REALLY BELIEVE THIS!” Yes, YECs really believe this, at least some of them. I’m really not sure what else to say here — it’s just kinda laughable; it makes no sense, and it’s pretty much 100% up to the creationists to provide any evidence for it. I should also note that the evidence shows there have been dozens if not hundreds of these reversals throughout time. Now, my understanding was the Judeo-Christian biblical flood lasted 40 days. And then roughly a year before they went away (um, where?). So you’d need to flip that field something like once every three days for that to work out, just FYI. A Test for Scenario 2? Dr Humphreys also proposed a test for his model: magnetic reversals should be found in rocks known to have cooled in days or weeks. For example, in a thin lava flow, the outside would cool first, and record earth’s magnetic field in one direction; the inside would cool later, and record the field in another direction. Their work was done in 1989, and actually published in a reputable journal (one that I just got two co-authored papers accepted in, if I may add). With the wonders of the internet, and people posting their papers on their personal websites, you can view it yourself. IF you’re a close reader, you can quickly see that the Creation.com article does misstate their research, for their paper clearly states they found evidence of a change of 3°/day, which means it would be 60 days for a full 180° flip. I’m not sure why it took me so long to do a post on the creationist claim of a decaying magnetic field being evidence for recent creation. Oh well. Anyway, I hope that if you have some creationist leanings and have thought that this claim held charge, that you have at least begun to re-examine it and will dig deeper. DON’T take my word for it, but use this as a starting point to inquire further. If you are someone on the fence, I hope this will push you over onto the side of real science and not the side of making things up. And if you were already science-minded and didn’t believe the YEC side, but you didn’t know exactly how to refute this particular argument, I hope that I have helped arm you for the future. P.S. Based on the Creation.com article number, I don’t actually think that it is very recent, but it was at least (re-)posted in the last few days of writing this.